Risk management is the strategic assessment, mitigation and prioritization of risks to prevent loss to a business through the use of insurance, safety measures and other efforts. Savvy companies know that risk management is a key business discipline and that understanding risk, predicting where it may occur, and minimizing the possibility of harmful effects on corporate objectives, is of greater benefit than simply reducing the cost of risk. SandRun Risk’s experienced professionals have deep subject-matter expertise in risks faced by companies and keep clients advised of emerging trends, industry benchmarks, and best practices. By combining in-depth industry knowledge and experience with practical technologies, we help companies assess their risks, improve their risk profile, and mitigate and manage their risks. Relying upon our extensive relationships, we collaborate with brokerage firms, insurance company underwriters, experts, other professionals, claims handlers, and coverage counsel, to help companies increase their transparency and accountability by developing and designing creative solutions to their business issues as well as to assess, mitigate and manage their various forms of risk. At SandRun Risk, we believe that risk management should be a part of the company’s leadership and continuous improvement processes. Our work in lean risk management improves the financial performance of our clients’ businesses by identifying and minimizing the causes of loss; identifying and removing sources of waste; and focusing on the outputs that are critical to the company’s customers. At SandRun Risk, we begin the risk assessment process by identifying the types of risks that the company might be exposed to and determining which ones can be managed. This involves identifying those incidents, occurring internally or externally, that could affect strategy and achievement of the company’s objectives. We not only identify each potential risk, but note the impact of that risk and any control activities in place to address the risk. During this phase, risks are ranked. Once a risk assessment has been completed, the risk is graded using a risk grading matrix (low risk, medium risk, high risk and critical risk for example) to help estimate the Likelihood x Consequence of a risk being realized and to give a resulting overall risk score. 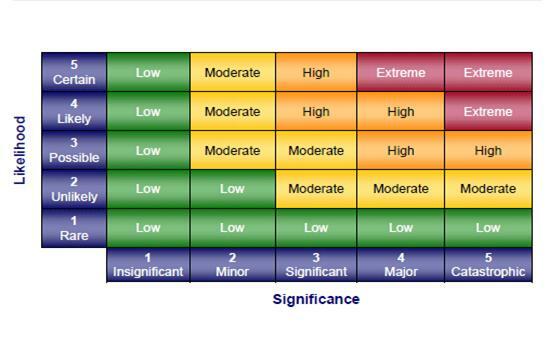 A risk map, like the one below, can then be generated to graphically show the risks and their rankings. SandRun Risk consultants help companies decide how to mitigate their risks. There are various risk mitigation strategies that a company can take. One strategy is to avoid the risk altogether. If certain activities are outside the core business and the level of risk is high, then consideration should be given to ceasing or avoiding those activities. Another strategy is to accept the risk as a cost of doing business if the risk is considered low. A third strategy is to transfer the risk to a third party such as an insurance company. A final strategy is to establish controls either before the risk occurs or after it has occurred. Risk mitigation is all about understanding those risks that can impact the objectives of a company, and taking the appropriate steps to reduce the risks to an acceptable level.